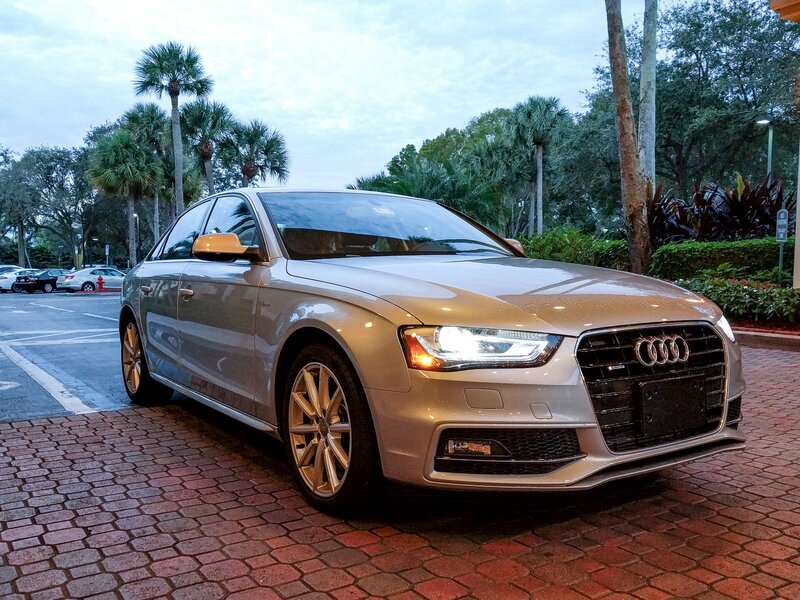 Your Android or iPhone plays a cursory role in renting one of Silvercar's Audi A4s, but the experience is great nonetheless. "Another startup-type company trying to disrupt things?" you ask? Sure. But my initial experience in Fort Lauderdale left me pretty excited. The pickup process varies a bit by location. And as it turns out, Fort Lauderdale is the most difficult, not actually allowing Silvercar to conduct the hand-off on site. So once I arrived at the Fort Lauderdale airport — wife and young daughters in tow — we all hopped on the rental car center shuttle. Halfway there I texted the local Silvercar location (there's a big "Come pick me up!" button in the app that starts the SMS for you, which is handy), and they met us at the rental car center with a pair of cars, just in case all four of us and our luggage didn't fit in one, along with a driver. (The Fort Lauderdale team, smartly, asked how many people and how much luggage we had.) From there it was a 5- or 6-minute ride to Silvercar's off-campus location. Again, this is the outlier. Other cities will be much easier to use. Still, it was maybe an extra 10 minutes, total. Not a huge deal, even herding cats as I was, and the app did a nice job of telling me exactly where to go. Once we were at the location, I used the Silvercar app to scan a barcode on the A4 we'd be renting for the weekend. This "unlocks" the car. A cursory check of my license and credit card — information I'd already entered when I signed up; they just confirm it the first time you rent — and we were on our way. As simple as it's ever been, and quicker, I think, than any other time I've rented a car. When it was time to return the car (again, at a date and time I'd set up at booking), I just hit the saved location in the Audi's nav, and drove back to the Silvercar lot. From there we were dropped off at the departure level of the airport, and I quickly got a final receipt. Initial estimate: $251.04. Final cost: $272.28, with most of the difference being fuel. All in all, a very good experience. The biggest hiccup for me was that the Fort Lauderdale location didn't have a child seat available (sold out for those dates, I was told), and I had to lug my own along as checked baggage. In any event, a booster seat would have been $60 extra with the rental company I didn't go with. Silvercar (if they have them, I guess) does them for free. I don't know if I'll use Silvercar every time I have to rent a car. I'll still shop around a little bit. If it's cheaper? Definitely. If it's close? Probably. The A4 was a nice ride. The employees who helped us out were personable and eager to help. The pickup and drop-off procedures — even at the more difficult FLL — were easy enough. And I'm all for a little disruption in the same old services. When you're traveling — and especially when you're spending out of your own wallet — you generally want to save as much as possible. And Silvercar — independent of my personal experience with their service — has rigged up a 15 percent-off promo code for our readers. Just use Android15 when you reserve your rental. Note that you'll actually want to use this on your second rental. When you initially sign up with Silvercar you'll get an offer for $50 off your first rental. Use that first. Then use Android15 on your second rental.